Here’s a look at the Kpreps Rankings for Week 9 as we have two new No. 1s in the polls this week. We are also ready to begin the “first round” or “Week 9” of the new playoff format for Class 6A and 5A. Once again there are no changes in the Class 6A poll this week. Most notable was No. 5 Garden City’s 21-14 overtime victory over Great Bend. The Buffaloes stopped Great Bend quarterback Jacob Murray short of the goal line on fourth-and-1 to end the game. The other notable game involving a 6A ranked team was No. 2 Blue Valley’s 45-34 win over St. Thomas Aquinas. Top-ranked Derby rolled to a 53-0 win over Haysville Campus, while Shawnee Mission East blew past a good Shawnee Mission West team, 54-0. Finally, No. 4 Manhattan pulled away from Blue Valley Northwest to win 45-21. Great Bend retains the top spot in this week’s poll despite the Panthers’ 21-14 overtime loss to 6A No. 5 Garden City. The Panthers claimed the No. 2 seed in the west bracket behind Wichita Heights. The Heights Falcons remain ranked No. 3 in the Kpreps poll after a 55-27 win over Wichita South. Bishop Carroll is No. 2 after the Eagles beat rival Kapaun Mt. Carmel 25-3 in the Holy War. Carroll was awarded the No. 5 seed on the west bracket and will take on the very same Kapaun Crusaders, the No. 12 seed, again this week. Goddard blasted Newton 62-20 to claim the outright AVCTL-II title. The fourth-ranked Lions are the No. 4 seed on the west and will host Salina South. Finally, Topeka Seaman enters the rankings after 6-2 regular season that earned Glenn O’Neil’s Vikings the No. 2 seed in the east bracket. Seaman checks in at No. 5 in the rankings this week despite a 20-13 loss to Junction City (7-1) last week. St. Thomas Aquinas, which has lost two straight games entering the playoffs, fell out of this week’s poll. In 4A, Division I, Bishop Miege is still on top after a 50-0 shutout of De Soto. The Stags will host Spring Hill this week. Basehor-Linwood led Atchison 13-0 at halftime, but pulled away for a 42-12 win. Atchison played without starting quarterback Adam Smith and will need some help reaching the playoffs after beginning the season 6-0. Buhler remains at No. 3 this week after winning the District 7 title with a win over El Dorado. Fourth-ranked Andale blasted Towanda-Circle 63-14 to keep the District 7 runner-up spot within reach. The Indians travel to El Dorado this week with the winner going to the playoffs. Finally, Maize South rolled to a 41-18 win over Rose Hill. The fifth-ranked Mavericks will host Andover Central (2-6) this week. We have a new No. 1 in Class 4A, Division II. Defending champion Holcomb’s 16-game winning streak came to a halt with a 35-28 loss to Pratt. 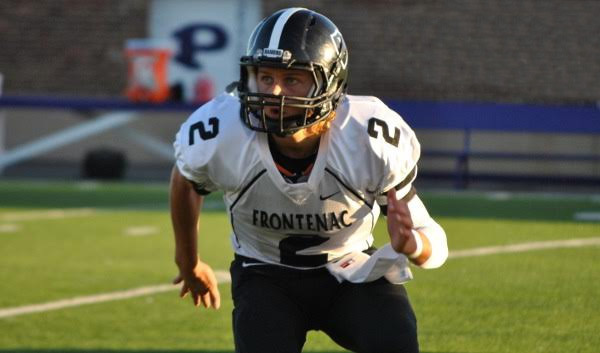 As a result, Frontenac moves up to the top line in this week’s poll. The Raiders got a touchdown pass from Brandon Mlekus to Isaac Bicknell midway through the fourth quarter to edge Columbus 21-20. Pratt moves up to No. 2 in this week’s poll after claminig the District 8 championship with the win over Holcomb. The Longhorns drop two spots to No. 3 in this week’s poll and must win against Hugoton to have a shot at defending their 2015 state title. Topeka Hayden clinched the District 1 title by winning at Holton, 47-32. The Hayden Wildcats trailed 26-14 before taking advantage of several Holton turnovers in the third quarter to rally for the lead. Finally Columbus drops two spots to No. 5 this week after the 21-20 loss to Frontenac. The top five spots in Class 3A remain the same this week, but not without a big scare. Second-ranked Silver Lake scored once in the third quarter and once in the fourth to hold off Perry-Lecompton, 21-19. Hoisington remains in the top spot after a 56-27 win over Larned. Phillipsburg was impressive in their 36-13 win over rival Norton in which the Panthers scored the game’s final 23 points. Rossville remains at No. 4 this week after blowing out St. Marys 63-10, and fifth-ranked Nemaha Central had little trouble with Riverside in a 53-0 win. The Class 2-1A poll remains the same this week. Top-ranked Troy defeated Jefferson County North, 38-12 in a battle of unbeaten teams. Plainville retains the No. 2 spot after shutting out Ellis 48-0, while No. 3 Smith Center rolled past Republic County. Lyndon won a hard-fought 20-7 game against Chase County. The Tigers remain in the No. 4 spot ahead of their game with Olpe to close out the regular season. Finally, Washington County stays at No. 5 this week after beating a solid Wabaunsee team, 28-15. The Tigers travel to Valley Heights (7-1) in a game that will decide both playoff spots for District 2. Defending 8-Man, Division I champion Spearville finally gains enough votes to edge out St. Francis for the top spot in this week’s poll. The Royal Lancers beat Leoti-Wichita County 56-6 last week, while St. Francis shut out Quinter 57-0. The Lancers and Indians have been 1-2 in the poll all season and separated by mere votes. This is the first week that Spearville has taken over the top spot. The remainder of the poll looks the same with No. 3 Burlingame, No. 4 Osborne, and No. 5 Central Plains all rolling to big wins last week. Have things finally stabilized in the 8-Man, Division II poll? Hanover sits atop the poll once again after a 54-8 romp over Wakefield. Pike Valley built a big lead before being tested by Beloit St. John’s-Tipton in the second half of a 40-34 win. The Panthers claimed the district title with that win, while St. John’s-Tipton and Mankato-Rock Hills will battle for the other playoff spot this week. Dighton remains at No. 3 after blasting Hodgeman County 58-8 on Friday. The Hornets have won the challenging District 6 title thanks to wins over Hodgeman County, Sharon Springs-Wallace County, and Otis-Bison; all of which have been ranked at some point this season. Wallace County remains ranked at No. 5 in this week’s poll, just behind No. 4 Hartford. The Jaguars clinched the District 2 title with a 62-6 win over Norwich.